Miller Beer and Fireplace Ad 1962 This is an October 20, 1962 advertisement. It is a nice color ad for Miller Beery. Pictures a young couple in front of a fireplace, with the family dog. He is holding a glass of Miller Beer, she is holding a bowl of popcorn and petting the dog. Her glass is sitting on the floor. Homey picture. In mint condition. This photo is taken through plastic and may show wrinkles or crookedness that is not in the ad. This magazine tear sheet measures 10"" wide by 13 3/4"" tall. 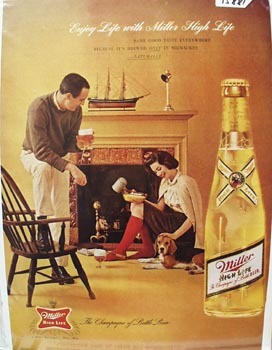 Items Similar To "Miller Beer and Fireplace Ad 1962"